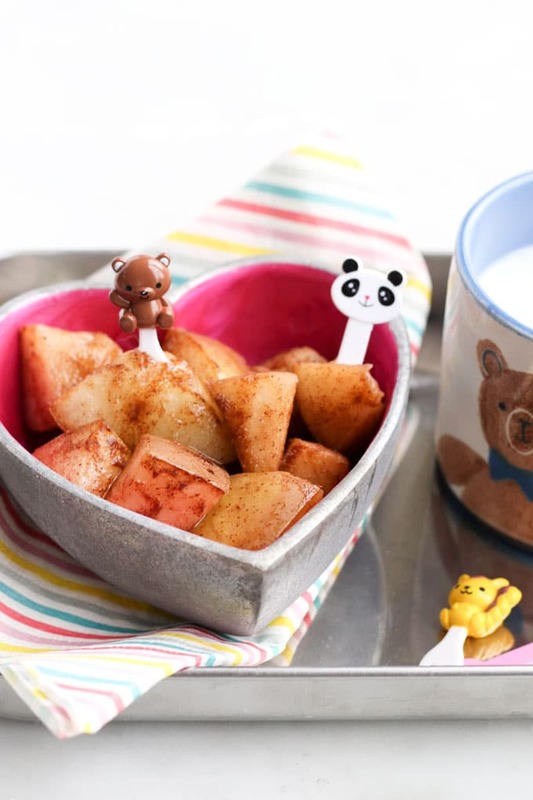 Baked Pears - Healthy Little Foodies. Baked Pears are a delicious dessert for babies, children, and adults. Baking and spices enhance the natural sweetness of the pear meaning there is no need for sugar and sweeteners. Everyone who knows me appreciates that I am NOT a winter fan. However, I do love all the deliciously spiced winter foods and drinks. Baked fruit is something I make often in the cooler months. I love how it fills the house with beautiful aromas and how wonderfully sweet the fruit turns when baked. Pears are one of those fruits that have a short window of perfection. You wait and wait for them to ripen and then before you know it, they are past their best and all mushy inside. The good thing about baked pears is that you don’t have to wait for them to fully ripen, they just might take a little longer to bake. You can’t really get a simpler dessert than baked pears. They taste delicious on their own but can be enjoyed in many other ways too. Yoghurt Top some greek yoghurt with the pears for a healthy and delicious dessert. Oats Stir through porridge or top with granola for a delicious breakfast. Ice-Cream For a more indulgent dessert, serve warm with some vanilla ice cream. I like to bake them in bite-size pieces as I find this a great size to add to yoghurt, oats etc. Cut the pear in half and remove the core. The easiest way to do this is to use a melon baller. The stalk is then easy to remove or cut out. Cut into slices or bite-size pieces. 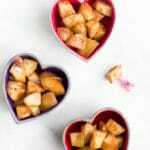 If you are doing baby-led weaning then baked pears are a perfect finger food. I baked them as fingers when my youngest was just starting out with food. Once he had developed his pincer grasp I cut them into the bite size pieces as pictured. Baking fruit changes the taste and texture of fruit. If you have a child that doesn’t like fresh fruit then try baking it . The enhanced sweetness and softer texture may win them over. Have you tried this recipe? I’d love to know what you think, please rate and leave a comment below or tag me on Instagram or Facebook. 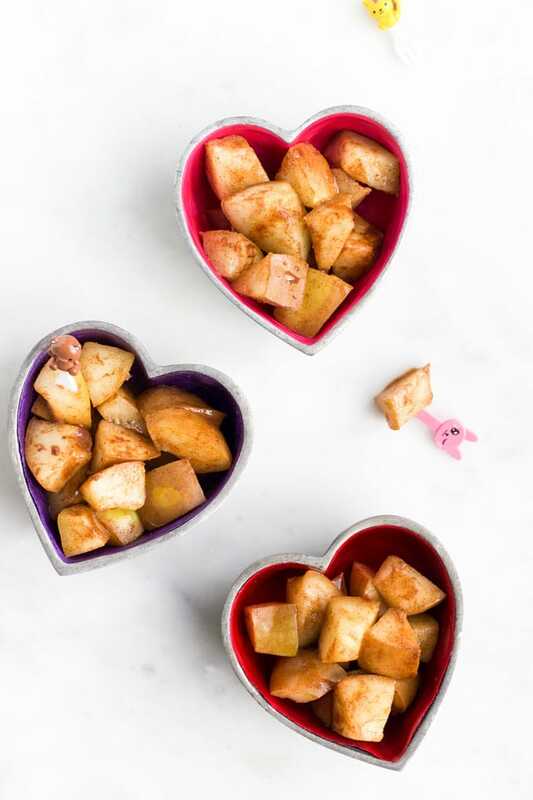 With no added sugar or sweeteners, these baked pears are a healthy and delicious snack, breakfast or dessert. 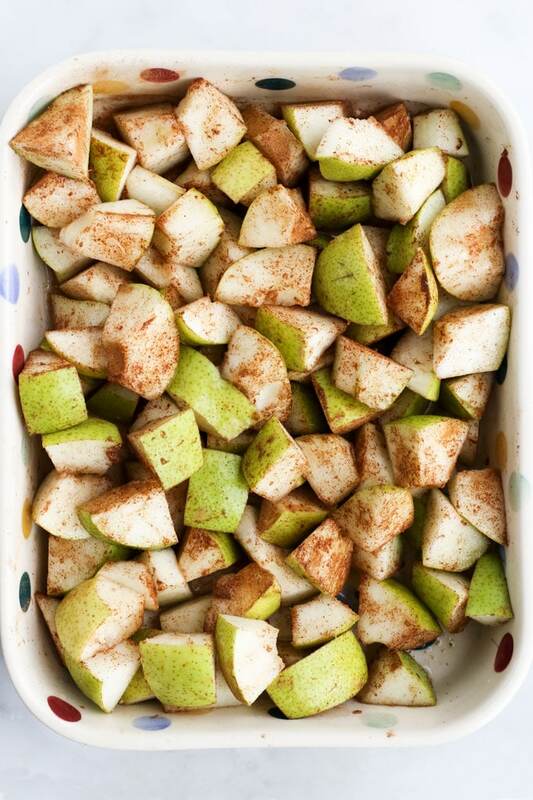 Add pears to a large baking dish and sprinkle with cinnamon and ginger. Toss the pears and add the water, toss again. Cover with foil and bake for 20-40 minutes (*SEE NOTE 3), checking and stirring once or twice during cooking time. 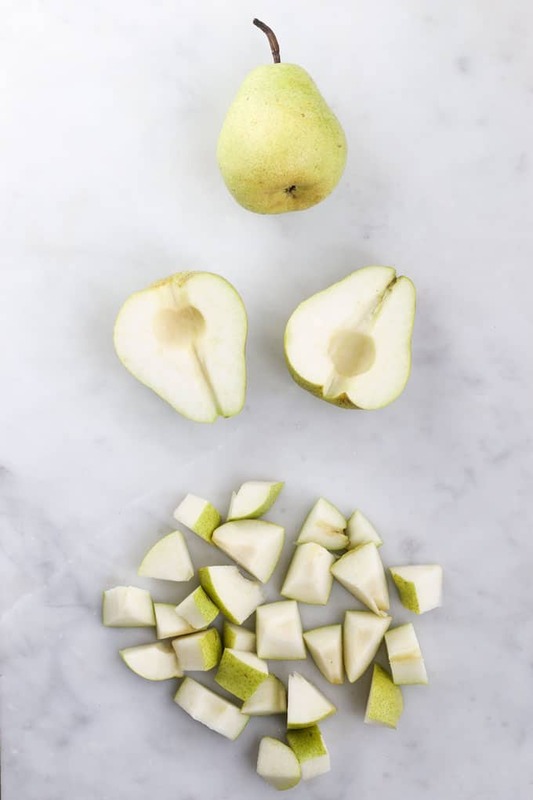 The easiest way I find to chop a pear is to half, remove the core using a melon baller and then chop into bite-size pieces (see above image for illustration.) I don't peel the pear but you can if you prefer. The cooking time will vary depending on the ripeness of the pear. Cook until soft (or desired texture.) My pears were unripe and needed 40 mins. Nutritional information is a GUIDE only, calculated using an online calculator. Results will vary depending on pear variety and size. A delicious dessert now that it is getting cooler, would this work with whole pears to save me chopping? I’m doing baby led weaning and made these for my 7myth old. The only change I made was to cut them into strips so she could grab it easier. She loved them. Ive just made these and they are delicious ! Are they suitable for freezing please ? HI Becca, so glad you liked them:). Yes, they should freeze fine although I haven’t actually tested freezing this recipe.